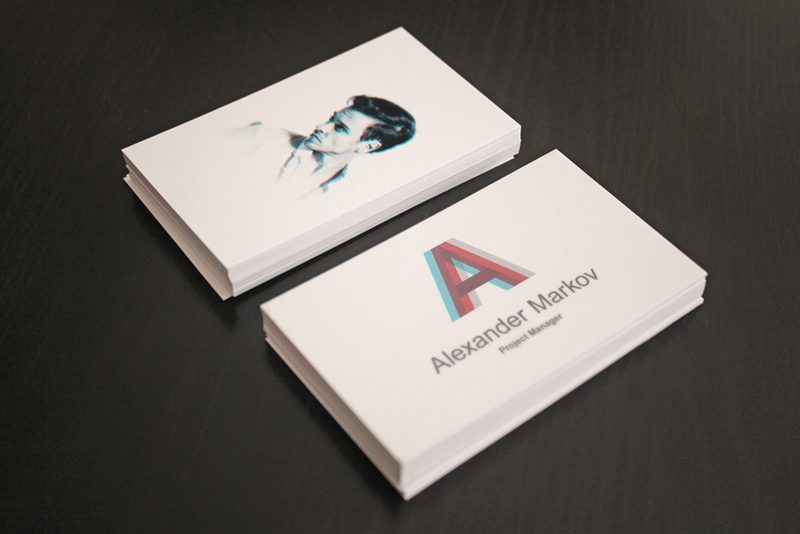 In this tutorial we’ll create an editable business card mockup using very simple photography and Photoshop techniques. You’ll be able to transform your photo into a customizable template, to showcase your design with elegance. 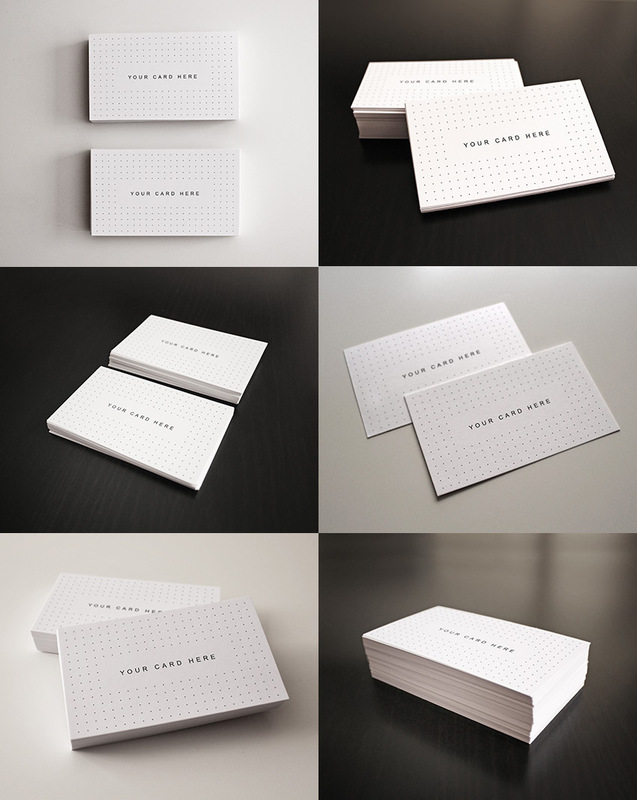 You can find my Business Cards mockups Bundle with 15 mockups on GraphicRiver. A mockup is an editable template that you can use to showcase a replica/model of your final product: in the graphic design field, it’s used to offer your clients a very detailed preview of what they ordered—in this case, a photo of their printed business cards. How to Design Your Card/Flyer. Use any software you prefer; Illustrator and InDesign are recommended when designing printable graphics. 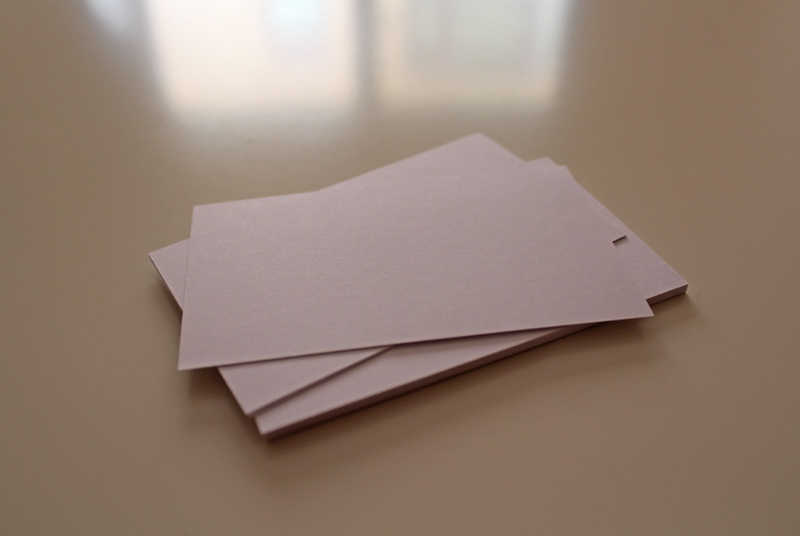 How to Photograph the Business Cards. 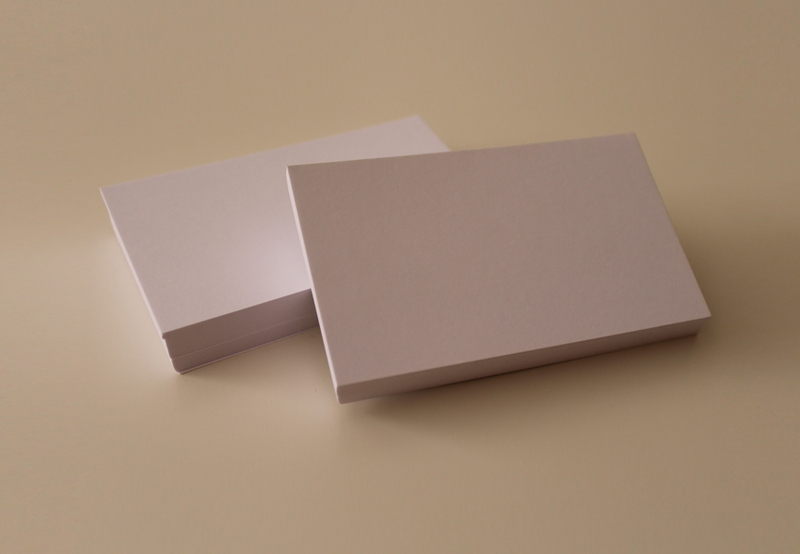 Place blank cards or any stationery element on a surface and take photos of them. How to Choose and Edit the Photos in Photoshop. Choose the best photos and retouch the composition. How to Add Smart Objects to the Photographs. 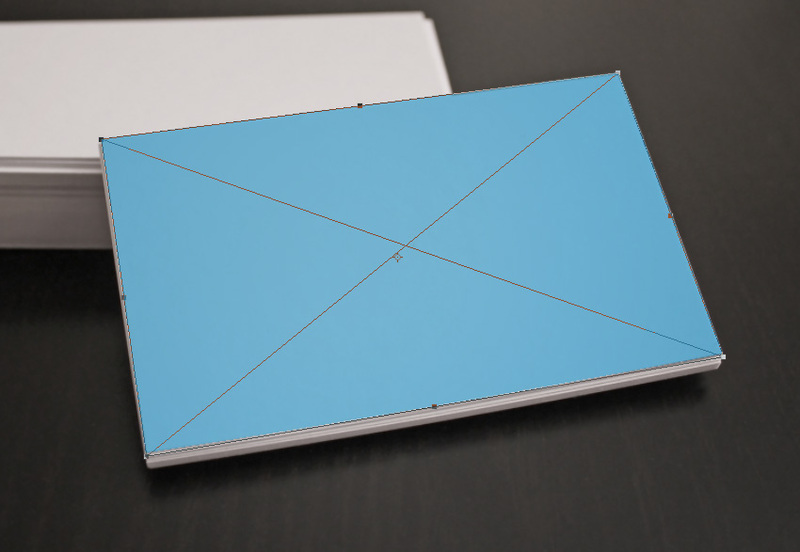 The card design will be added using these smart templates that automatically apply transformations and filters to a given image. 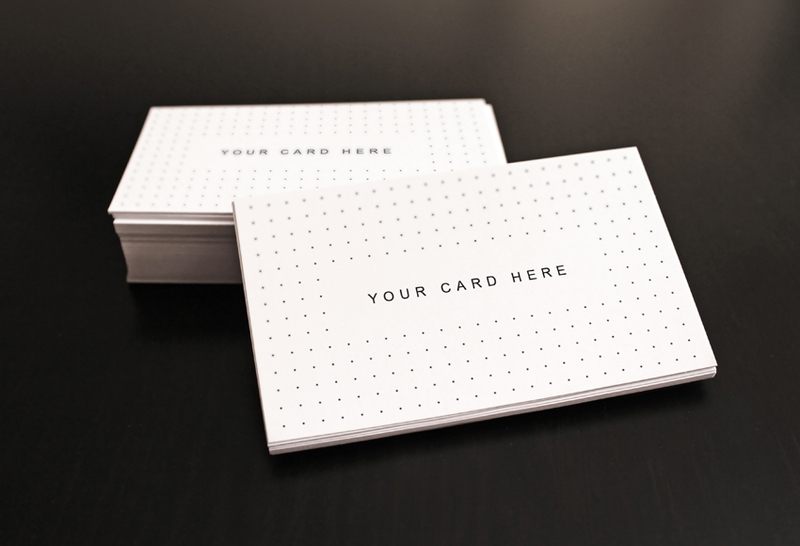 You can apply the techniques used in this tutorial when creating any type of stationery or branding mockup, so that you can show your customers a photo of the final printed result, without having to actually print it. Not everyone has access to professional photo shooting tools, but I will show you how to achieve a professional looking mockup nonetheless. 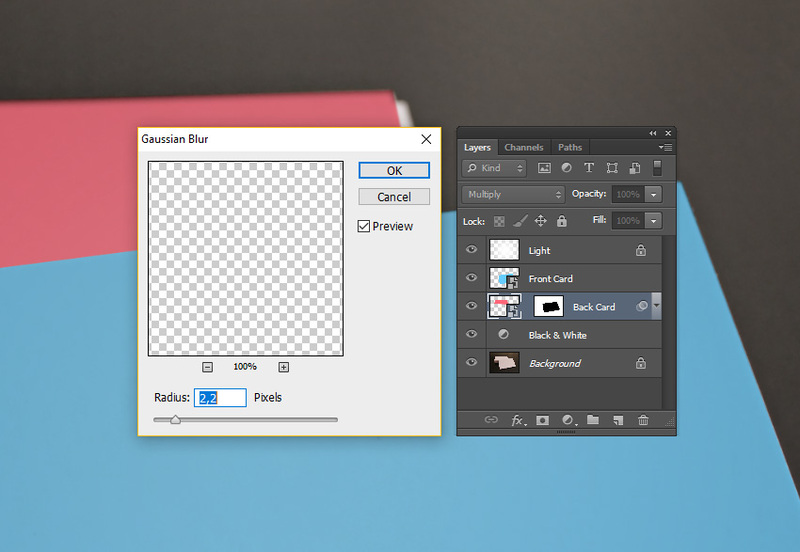 For this tutorial, you need Adobe Photoshop CS5 (or superior) and the best camera that you can access (even a good smartphone camera is surprisingly efficient). 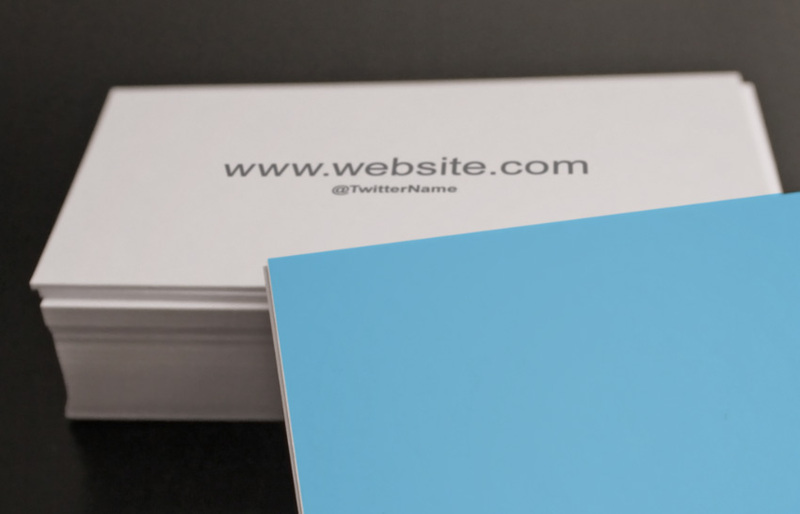 When you have to design a standard business card, consider the country to which you will have to deliver it and establish with your client the dimensions before starting your work. Each country has its own most used dimensions; you can refer to this guide for more information. You most likely want to set up your document in Illustrator or InDesign, because they’re specifically created for the printing process. 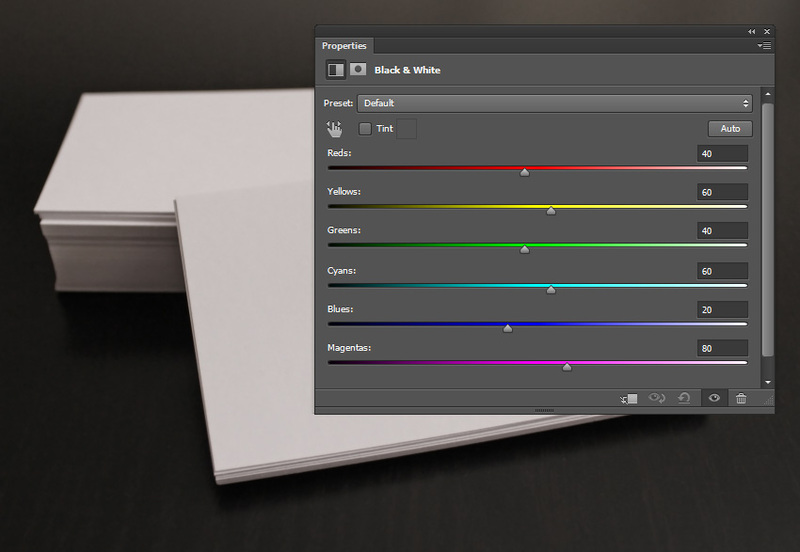 However, Photoshop can prepare a print document as well. If you like to work in Photoshop when it comes to printable graphics, you can use these useful Photoshop Actions: they automatically create documents in CMYK mode, 300DPI, with most of the standard international print sizes, including bleeds (necessary for the printing process). When creating a mockup, you don’t need to consider the bleeds and cut size because you can just place your design in the correct position. 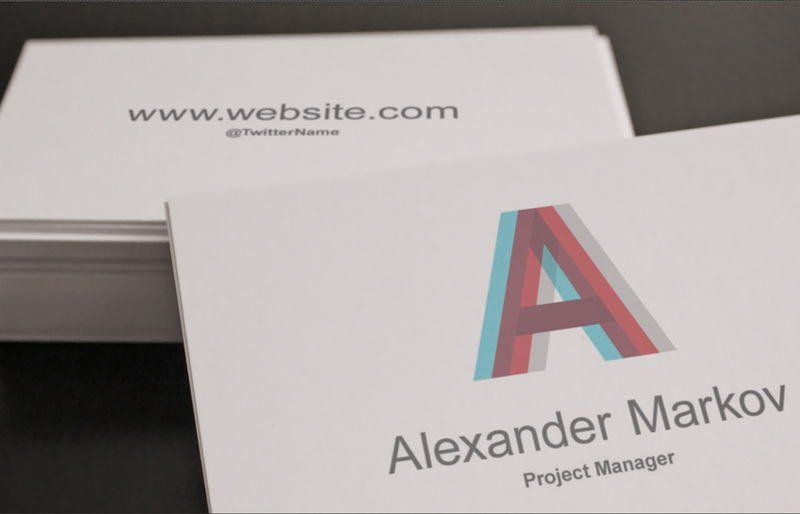 However, you should always design a business card in vector format, with print-ready colors, and consider the necessary bleed amount. 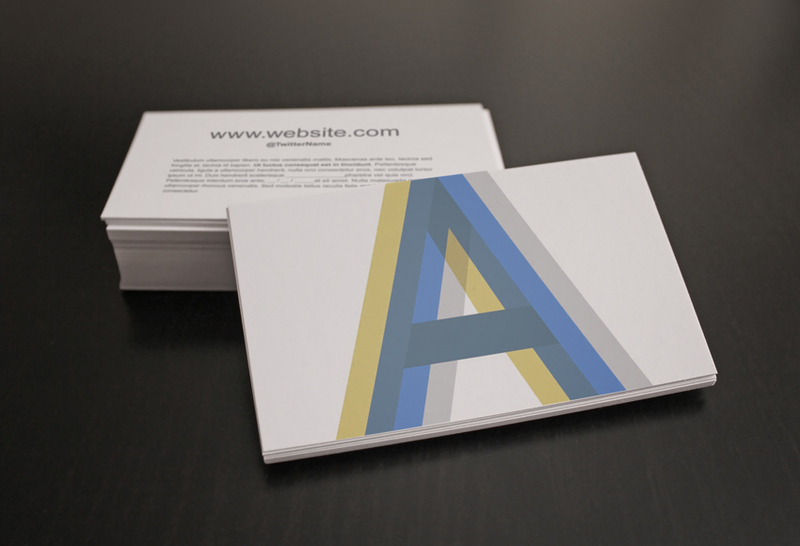 Check out more detailed guides on how to design a business card if you want more information. 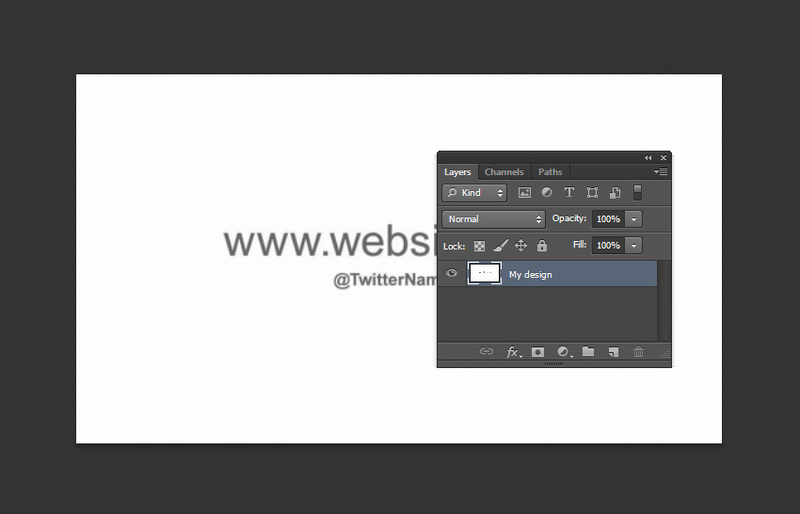 For this tutorial, we’ll use this simple design that I prepared. When it comes to photography, there’s a great abundance of guides and books dedicated to the photo shooting process: the lighting setup, the camera setup, etc. I’m not going to pretend to give you a complete explanation of these vast topics in these few lines, but I will tell you the simple key steps that will make your photo decent, even if the setup and the lights are not ideal. A darker photo is always better than a brighter one. 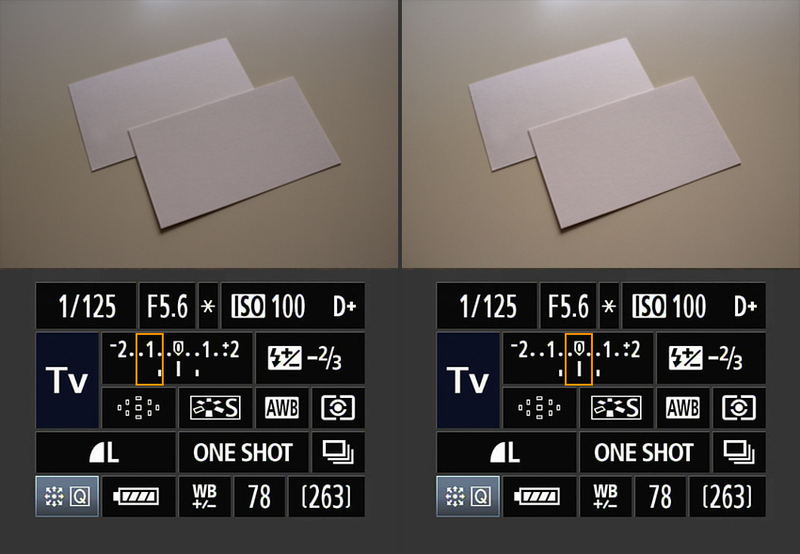 To deal with an underexposed photo is easier than an overexposed one. To retouch a darker photo is better than a darker one because in Photoshop you can restore information from darker shadow areas and reveal some of the lost details a lot more easily than you can from areas that are too bright, where sometimes all the pixels are just plain white. Always have one or more dominant light sources. Try to have a clear light direction in order to create an attractive defined contrast between lights and shadows that will make your design a lot more distinguishable. If you have no distinctive light in your scene, the subject will be very dull and bland in the final photo. You can use as many lights as you want. If you think the natural available light is too strong and will burn your shot, tune down the exposure in your camera: the correct exposure is always between 0 and -1. Be generous with the subject’s background. Maybe this is personal, but from experience I think it’s always better that you take a photo which includes more background than you will actually need: you can crop the photos in Photoshop carefully and focus on the exposure and scene while taking the photos. Many times it will happen that you want more “air” on your subject, and you’ll have to create parts of the background because we took the photo too close to the subject. For this tutorial we’ll be working on this sample above: as you can see, I included more background than I would need, so that in Photoshop we have an easier time cropping the subject and a lot of space to work with. Below, you can see the actual final area used. Prepare the scene, being consistent with your task. Take your time positioning your elements on the surface and use your taste trying to create a composition that makes sense. 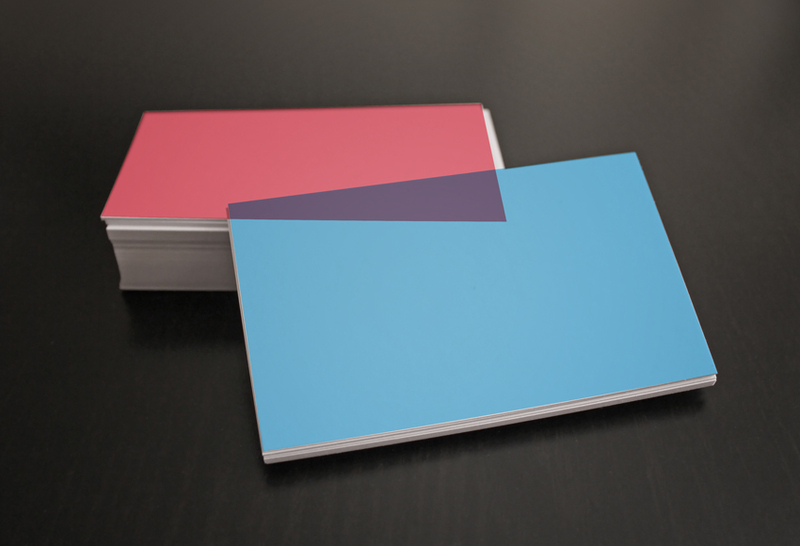 Showing two sides of the card is the most obvious choice, but not mandatory. For example, it’s not a fixed rule that the cards have to be placed with geometry (as I do in most my mockups because they look more institutional/corporate): in fact, they could be scattered on the table, or even aligned as a card castle as long as you think it’s attractive for you or your client. Experiment, and don’t stop trying other positions, moving the elements on the surface. Take many photos from many angles, change the light direction and intensity, etc. Always guarantee yourself plenty of selections at the end of the shooting section. Once we have finished the photography phase, transfer the photos from the camera to the computer and open Photoshop. 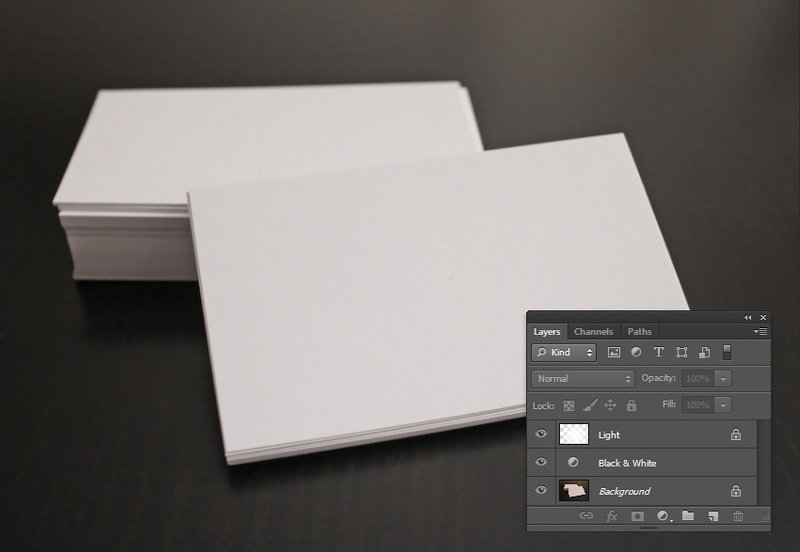 If you prefer Lightroom to adjust lighting and contrast, that is also a very valid alternative, but you will need Photoshop to create the Smart Objects for the business card design. Let’s continue with our sample: we’ve reached the point where we’ve decided how to crop our photo to enhance the subject. 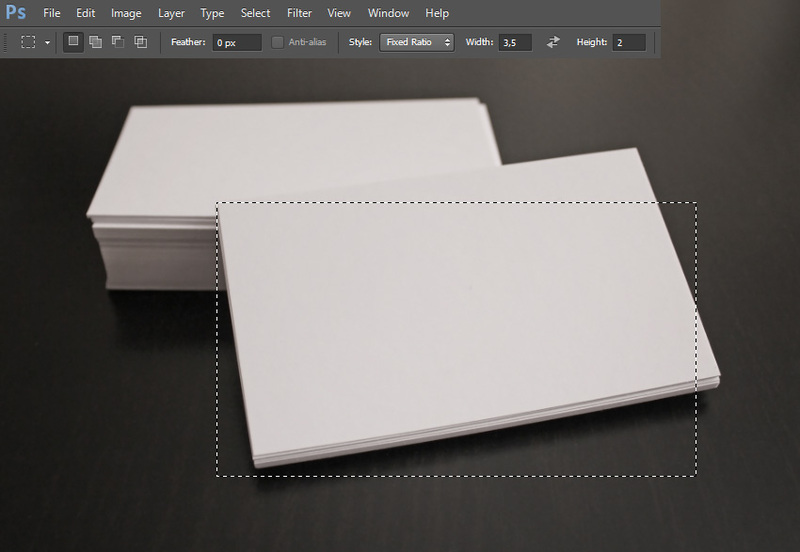 Use the Cropping Tool (C) or make a Selection with the Rectangular Marquee Tool (M) and then go to Image > Crop. Now let’s move on to adjusting the lighting, color, and contrast, and removing eventual spots and unwanted details. Before doing anything, we want to remove dust and spots that sometimes will be visible on the surface that we used, especially if it’s dark. Select the Clone Stamp Tool (S), Alt-click on a clean spot to refer to that portion of image, and then click on the spot that you want to cover. Also, the Healing Brush Tool (J) can be used efficiently. Below is the clean photo. I added also a soft light in the center to brighten the scene a bit. To create that soft light effect, pick a large Brush (B) with hardness set to 0%, and paint a white circle on a New Layer. 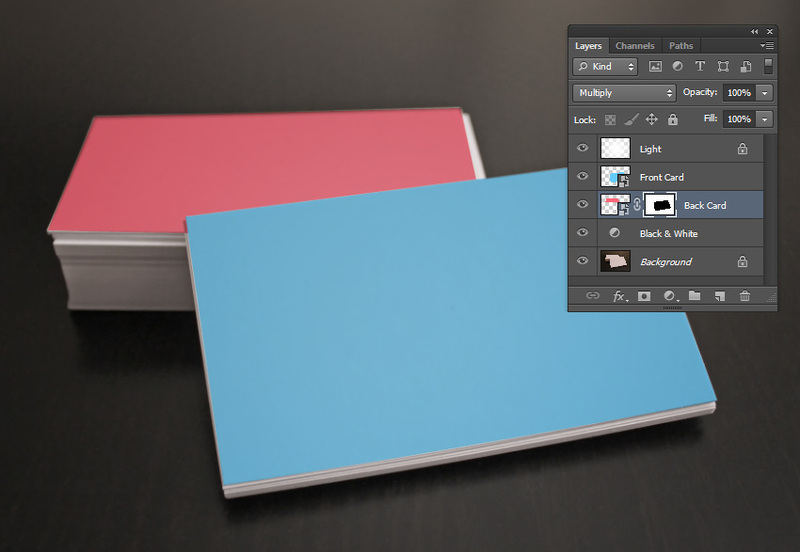 Change the Blending Mode of this layer to Soft Light, and our document should look like the image below. 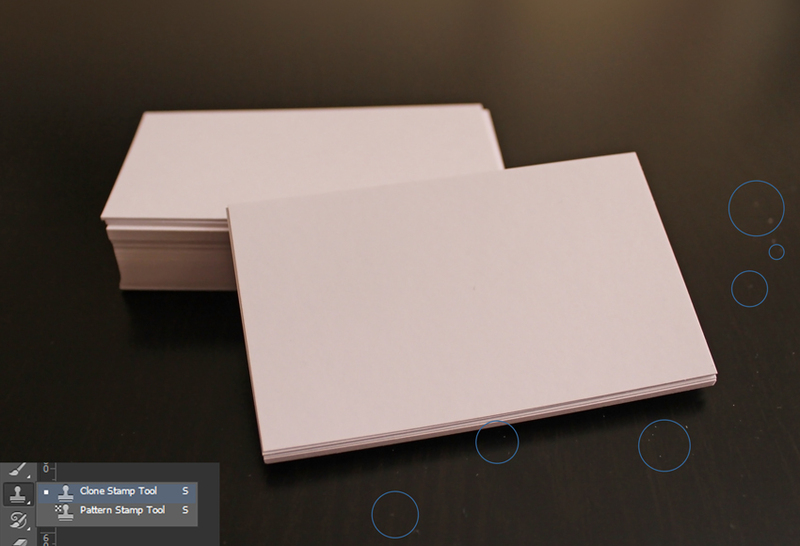 Now it’s time to add the Smart Objects that will contain our card designs. 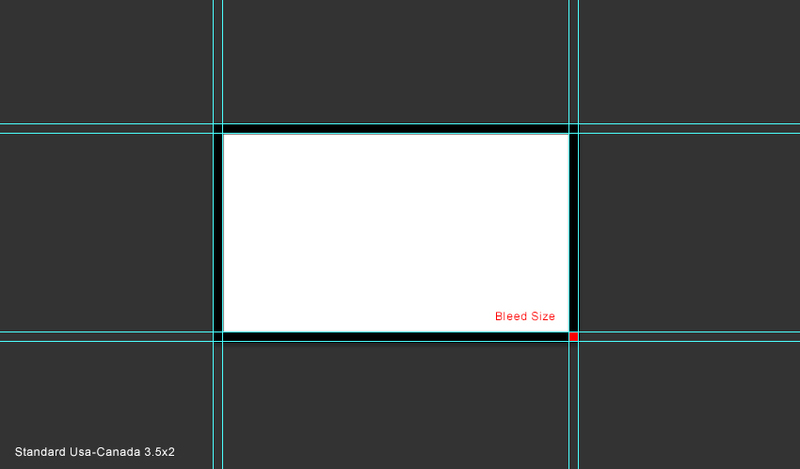 First of all, we need a template the same size as the card, so we create a selection using the Rectangular Marquee Tool (M) in Fixed Ratio mode, and enter the proportions of our card, which are in this case 3.5 x 2 since the card itself is 3.5 in x 2 in. 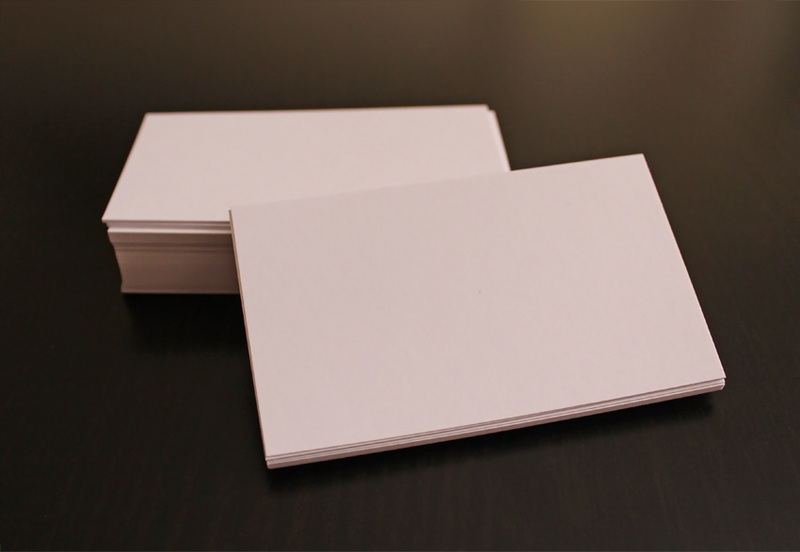 It’s not important that this selection matches the actual size of the card design; however, it is mandatory that we use the same proportions. 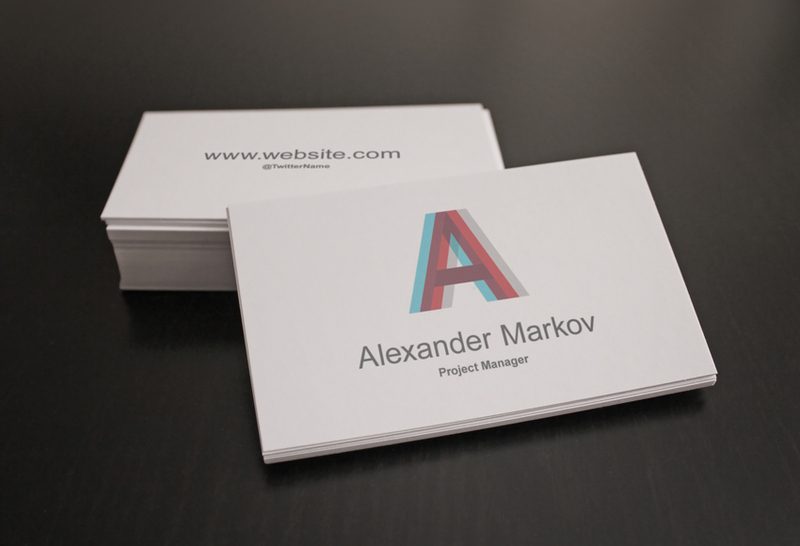 In this step, you have to create a selection which is as close as possible to the business card below. It depends on the photograph’s dimensions. 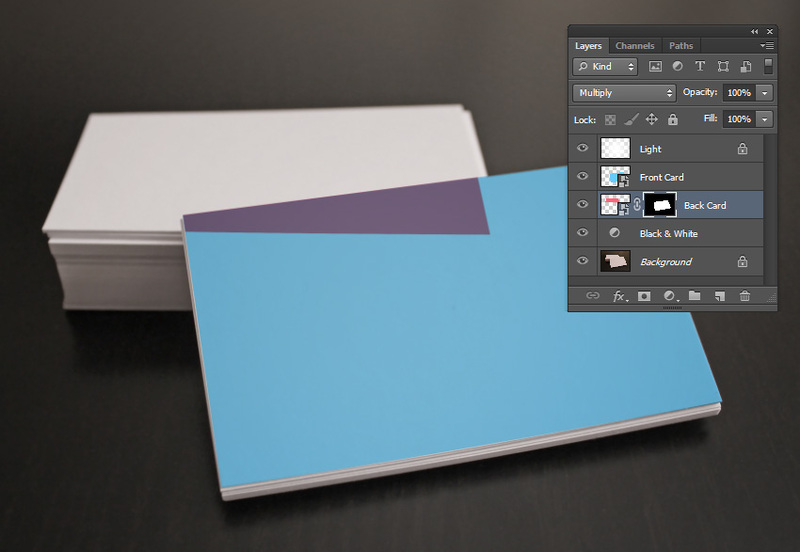 Fill the selection with any color on a New Layer and name this layer Front Card. 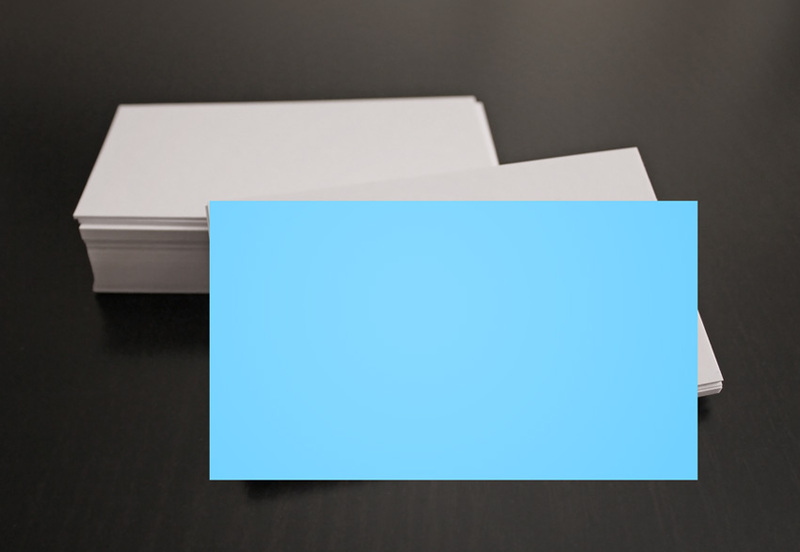 The layer in blue named Front Card will become our front card design. 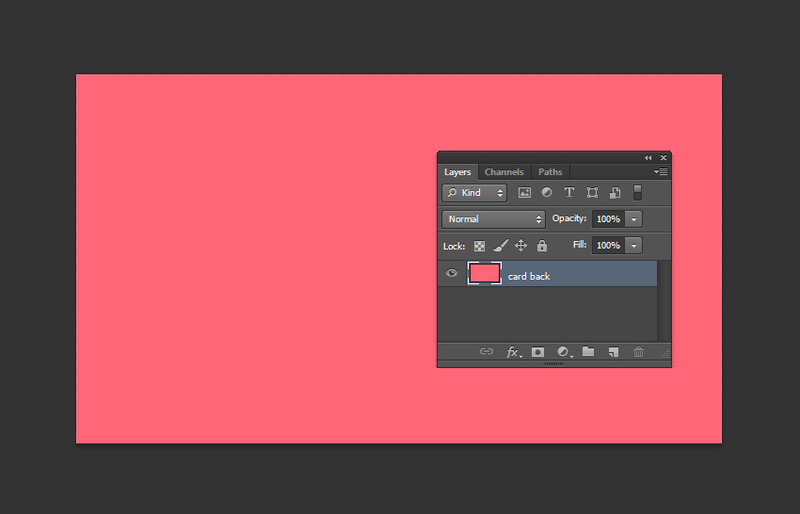 Right Click on it in the Layers panel and Convert to Smart Object. 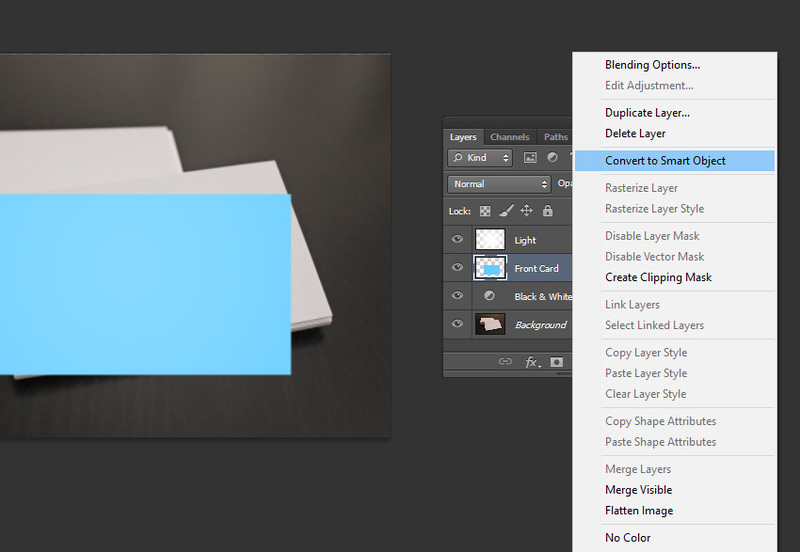 Set the Front Card Layer to Multiply Blending Mode so we can see what happens, and transform the layer using the Free Transform Tool (Control-T). 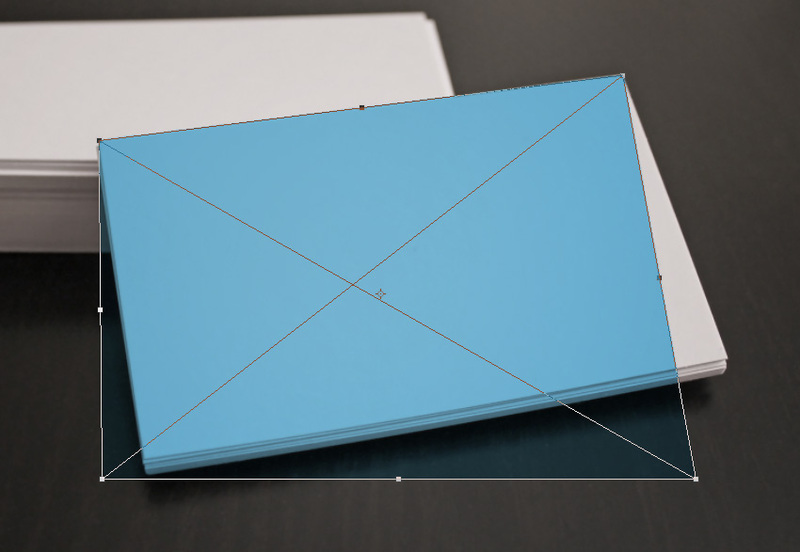 At the corners of your layer there are anchor points indicated by small squares; while holding Control, click on each of them to position this layer and match the card’s perspective. Do the same process with the card back, creating a New Smart Object (we’re using a red color this time). The fastest way to do this is to create a duplicate of that Front Card Smart Object. 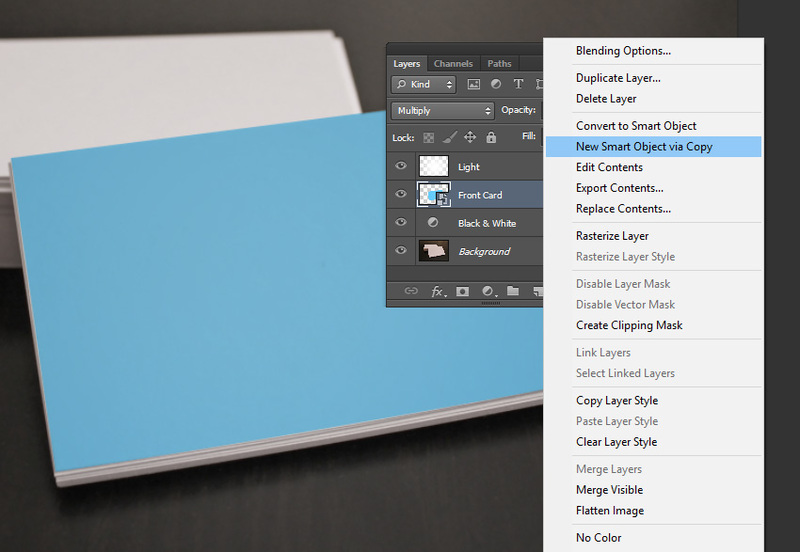 So Right-Click on the Front Card Layer and choose the option New Smart Object Via Copy, which will create a new editable copy of that Smart Object. Enter in the newly created Smart Object (Right Click > Edit Contents) and fill this one with another color (I used red) so we can distinguish them better. Finally, name this red layer Back Card. Apply the same transformations as we did with the blue layer, trying to match the corners as precisely as possible. The document should look like this. In this case, for the red Back Card layer, we will also have to apply a Layer Mask because the card at the back is partially covered by the ones in front. To do so, hold Control and click on the Front Card layer in the Layers panel; this will create the selection that we need. Then click on the Back Card layer and then on the Layer Mask icon. 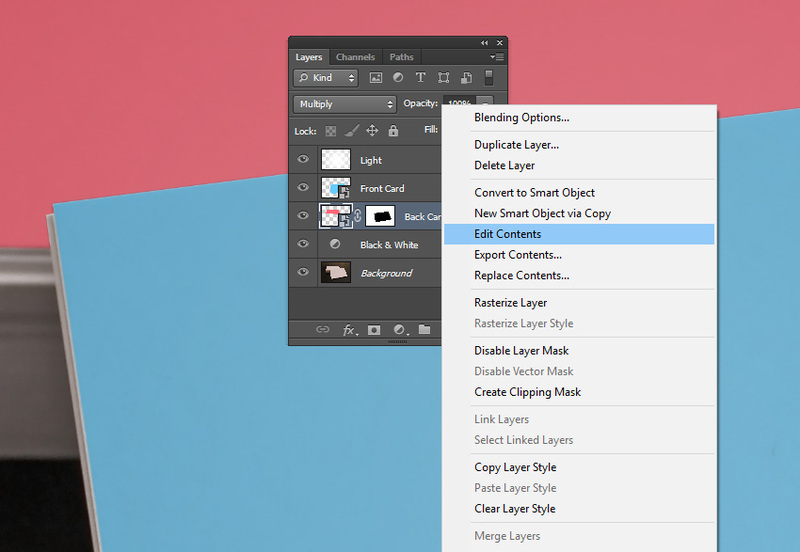 We just need to Invert the Layer Mask for our task, so click Control-I on the Layer Mask. Make manual adjustments if needed; below you can see how it was necessary to cover a bit of the card space that didn’t match the starting selection. Using the Lasso Tool (L), we select the small parts that still need masking. Now we need to blend the cards smoothly into the photo. The Multiply Blending Mode and the Layer Mask already do a great job, giving the illusion that the tops of the cards are now blue and red, but there’s a detail that makes the composition still not realistic, and that is the depth of field. To give the illusion of depth of field in certain areas, we just need to blur the edges of the Smart Objects so that they match the amount of blur in the photo below. Select the Back Card Layer (and not the Mask), go to Filter > Blur > Gaussian Blur, and choose an amount that matches the photograph below—for our photo, a value of 2/3 pixels. Below you can see the edges before and after the blur. Remember to work on the Smart Object so that it will register the Blur Filter as a Smart Filter and it will not modify the starting image inside of it. That’s why it’s called non-destructive, because it doesn’t actually modify the content of the Smart Object, but it works on its appearance. 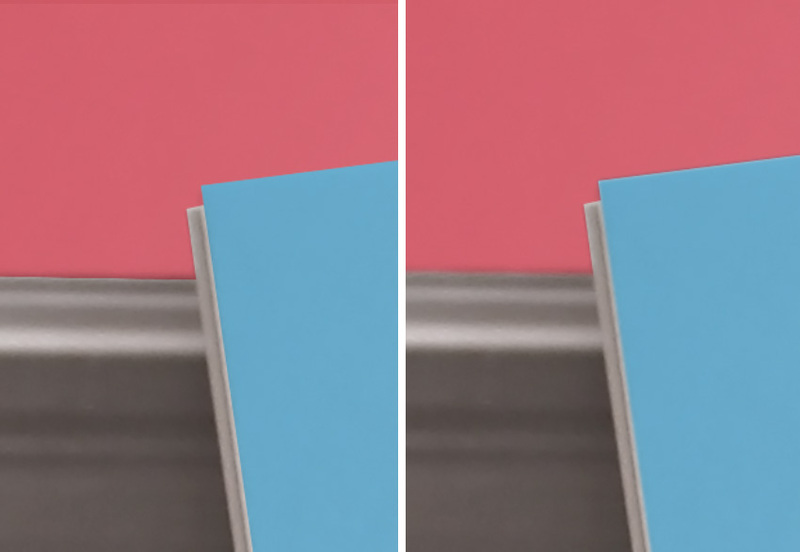 As you can see on the right where the Blur has been applied, the corners and edges blend together with the photo, resulting in a more realistic effect. But not only the edges—once you apply the design on the card, it will look out of place if it’s really focused and sharp, while the area surrounding it is all blurred. The blur amount must be consistent throughout the picture in order for the design to really blend in the photo. 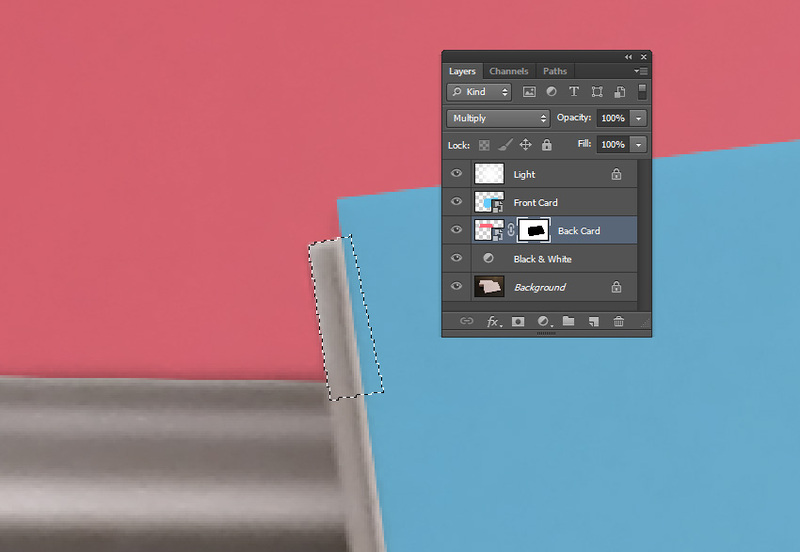 Select Back Card, Right Click on the layer, and then Edit Contents: doing so will open a new document (the Smart Object) where you can see our red layer. The content of the Smart Object should look like this. At this point, we just need to place our design into this document. Go to File > Place and select your image. Close the Smart Object now and Photoshop will ask you to Save. Click Yes and the Smart Object will automatically update the image, maintaining transformations and adjustments, so instead of the red color we have our design now. 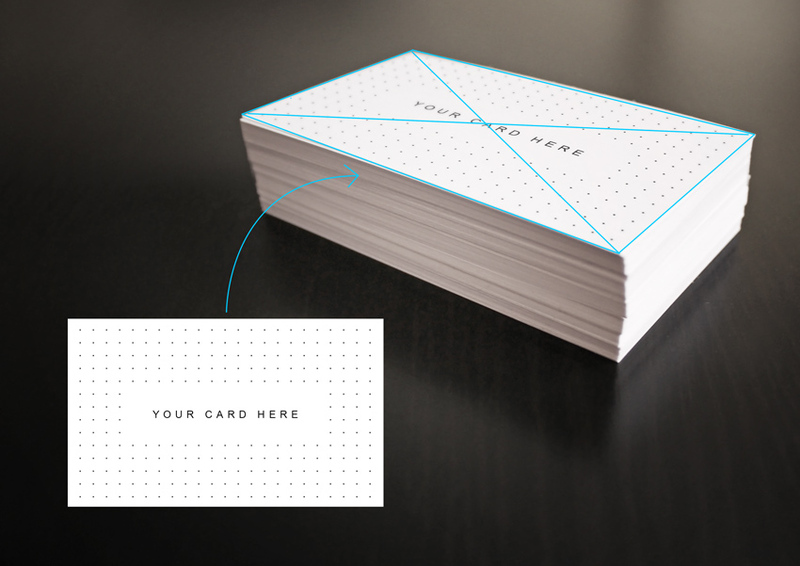 Do the same process with the Card Front Layer, and you have your beautiful, ready-to-use, customizable mockup. Test this mockup with other designs: the Smart Object will do all the work for us, and we can utilize this template to preview as many as we want. They can be also used to showcase flyers and posters because the photo doesn’t give any reference to the real size of the paper sheets. 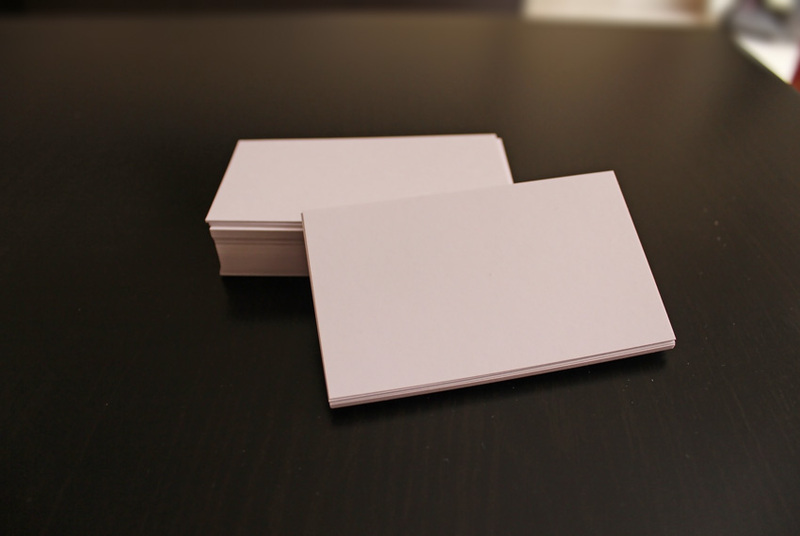 So they could be any size you need, as long as the proportions of the card and your design are more or less maintained.